Congratulations to Darren Quinn who recently was recognised as the runner-up for the VET Teacher/Trainer of the Year Award. 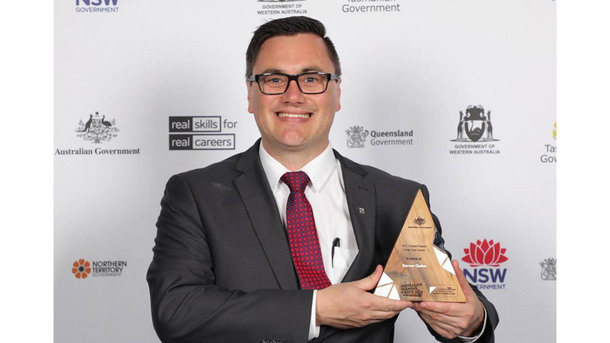 The recent 2018 Australian Training Awards brought together the nation’s best in vocational education and training (VET) sector. The 78 finalists comprising of apprentices, trainees, VET students, teachers, practitioners, employers and training providers were rewarded and recognised for demonstrating excellence in VET. "I am extremely honoured to be named runner-up in the VET Teacher/Trainer of the Year category of the Australian Training Awards. Almost 20 years ago gaining an Apprenticeship in the Automotive Industry changed my life and being able to give those same opportunities to young South Australian’s today makes my work an extremely rewarding experience," says Darren. Congratulations again Darren and thank you for supporting and developing our skilled trainees and apprentices across the CMV Group's light vehicle dealerships.